Back in April the Omni Group released OmniFocus 2.1 for iOS, a Universal app that runs on both iPhones and iPads. Among other things, this release brought some new features to the iPhone, including the review feature and the ability to create and customize perspectives. Watch our free video to learn more. The Omni Group have since released OmniFocus 2.5 for iOS, with integrated support for the Apple Watch. The Apple Watch version of OmniFocus gives you a convenient way to glance at the most relevant and timely information in your OmniFocus database. Delving a little deeper, the dashboard view provides a summary of what’s due today, any overdue items that have slipped through the cracks, flagged items and your inbox. Tapping on the item count for any of the dashboard items takes you to the actions themselves. If you’re out an about, you can tap Nearby on your iPhone and a Nearby button magically appears in OmniFocus for Apple Watch’s dashboard. 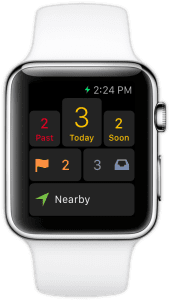 Tapping the Nearby button on your Apple Watch brings up a list of nearby locations and tapping on specific location provides you with a list of actions that are tied to that spot. You can use this same mechanism to access projects, lists and perspectives on your Apple Watch. Force touching the screen cleverly reveals buttons that allow you to add a flag to the item you were just looking at or to capture a new item to your OmniFocus inbox, with some help from the Apple Watch’s built-in dictation facility. Convenience is key when it comes to capture, making this feature particularly attractive. To see all of this in action, check out this fun video courtesy of the Omni Group. And visit the OmniFocus section of their website to learn more about OmniFocus for Apple Watch and their other offerings. This latest addition to the OmniFocus family will only be useful if it’s drawing information from a database that is up-to-date and relevant. For the dashboard view to be relevant, make sure that you’re only using due dates for things that are actually due and use flags sparingly to avoid having to wade through a long list of flagged items. For more information visit the free Best Practice: Use Due Dates Sparingly article.